Bengaluru: There is no doubt that the froth on the lakes of Bengaluru has generated a lot of interest - and attempts to clean it up. 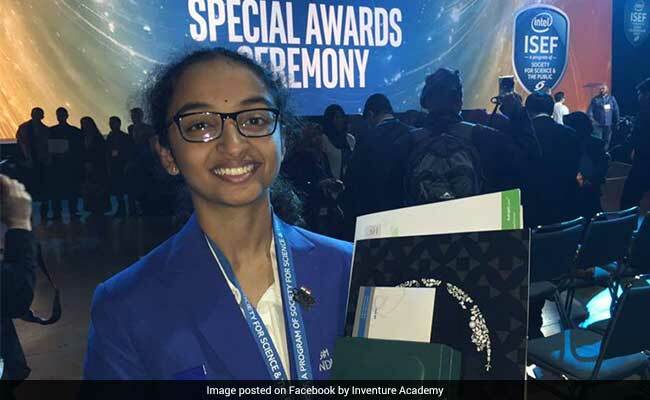 But the efforts of one Bengaluru student, Sahithi Pingali, have been recognised in a rather universal way - the 12th standard student of Inventure Academy has had a planet in the Milky Way named after her! Sahithi had developed an app to collect data on the frothy, polluted lakes of Bengaluru through crowd-sourcing. Her study of the lakes began through her school. She told NDTV in an e-mail interview, "I also had a chance to be a key part of Inventure Academy's change-making initiative, Our Lakes, Our Voice (OLOV), where I conducted an experiential case study on the foaming Varthur Lake." "We researched the various factors that contribute to the pollution of lakes in Bangalore through surveys, sessions with experts, and interviewing people who live and work around the lake; and carrying out regular water testing on nine different Bangalore lakes," she explained. "I was shocked to see the sheer extent of the pollution and sewage contamination happening in lakes across the city, and by the numbers of lakes that have simply disappeared due to encroachment and unchecked urban growth. I was also unaware of how critical the lakes are to life in Bengaluru - their loss has adversely affected climate, water supplies, biodiversity and so much more." Sahithi's app does not require scientific expertise to use. She said, "My system helps citizens collect data through a low-cost, easy-to-use mobile-based water testing kit. The mobile app works with electronic sensors and chemical test strips to let the user collect several physical and chemical parameters of a water sample. The sensors sync with the app by Bluetooth." "The chemical test strips work with an automatic phone-camera based color recognition and mapping software that I've built into the app. All you do is put the test strip inside a dark box, point your phone camera and flash at it, and click. The app maps the captured strip color to the contaminant concentration value, making everything easier and more accurate." She entered the app in the Intel International Science and Engineering Fair (ISEF) and was one of the 2000 finalists from around the world. 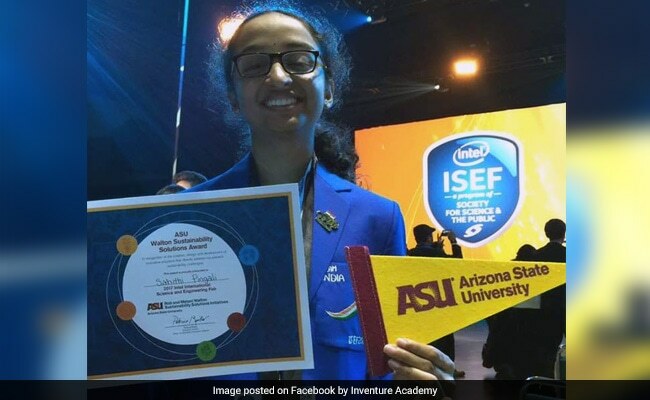 She came within the top 3 percent at the ISEF competition - and for that achievement, the Lincoln Laboratory of the Massachusetts Institute of Technology (MIT) decided to name a planet after her. MIT has the right to choose the name of minor planets. Sahithi is currently doing an internship at the Civil & Environmental Engineering Department of the University of Michigan. And water pollution is still on her mind. She hopes to learn more about detecting and dealing with water pollution. Sahithi is still hopeful about the survival of Bengaluru lakes. "Lakes are pretty resilient - some people call these wetlands 'kidneys of the landscape' because of their ability to bioremediate pollution and essentially clean themselves." "The problem we have is that we've taxed lakes beyond their ability to take care of themselves; if we cut down on pollution and make a coordinated effort to revive these water bodies, I believe they can be restored. Especially with the widespread citizen interest and various organizations recognizing the value of lakes, I think there's definitely potential to rejuvenate many of them," she said. 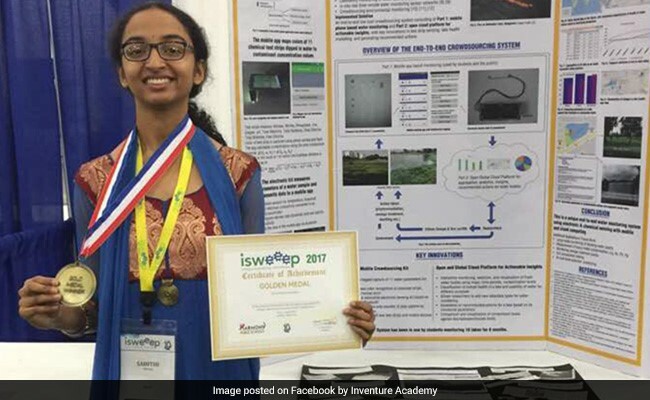 Her Bengaluru school, Inventure Academy, is proud of their student. "I admire Sahithi's focus, discipline and grit. And her ability to make the best of the opportunities that she has had access to including the Inventure Change Maker program including Our Lakes Our Voice - which is aimed at equipping students to be positive agents of change," Nooraine Fazal, Managing Trustee and CEO said. "It's very rare for someone her age to have these attributes and be so excited about spending weekends at our polluted lakes," she added. "I hope Sahithi and her class mates use their learning to solve the wicked problems that we face in India, irrespective of where in the world they go for their higher education." Sahithi has many interests apart from battling water pollution. She enjoys reading and writing for fun - and is also a classical Bharatanatyam dancer and plays the veena. 1) Why did you first decide to look at Bengaluru's polluted lakes? Was it a school project? I'd say the journey began back in June 2015, when I had the opportunity to study the impact of urban development on the city's lakes and water supply through a scholarship from Inventure Academy to participate in the American India Foundation (AIF) Youth Ambassador Program. Through this, I also had a chance to be a key part of Inventure Academy's change-making initiative, 'Our Lakes, Our Voice (OLOV)', where I conducted an experiential case study on the foaming Varthur Lake. I continued working on OLOV for the next two years along with all the other members of the Inventure OLOV team: Rishub Podar, Sanaya Katrak, Presha Sridhar, Samhita Ramji, Ekta Bhavanasi, Sachin Dwarakanath, Tarang Shah, Victoria Fernandez, and Arjun Sivappa. We researched the various factors that contribute to the pollution of lakes in Bangalore through surveys, sessions with experts, and interviewing people who live and work around the lake; and carrying out regular water testing on nine different Bangalore lakes. It was these experiences as a part of OLOV that first got me interested in this area and inspired my project. The dedication and commitment of my team members at Inventure was what convinced me that high school students were capable of gathering reliable water monitoring data while increasing their environmental awareness and knowledge of science. 2) What was the experience of studying the lakes like - were you surprised with anything you learnt? Studying the lakes was definitely an eye-opening experience. 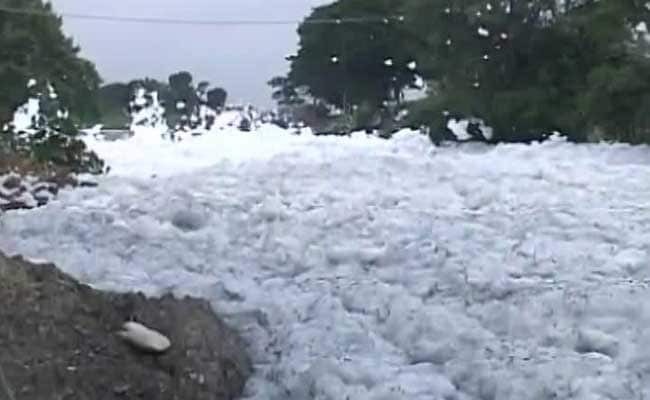 I was aware of the foam and fire on Bellandur and Varthur lakes, but I didn't know that those were just the tip of the iceberg. I was shocked to see the sheer extent of the pollution and sewage contamination happening in lakes across the city, and by the numbers of lakes that have simply disappeared due to encroachment and unchecked urban growth. I was also unaware of how critical the lakes are to life in Bengaluru - their loss has adversely affected climate, water supplies, biodiversity and so much more. In Bangalore, most of us know about the flaming, frothing lakes and the pollution issues that they face. More than ninety percent of our lakes are sewage fed! And it isn't just Bangalore. Across the world, two million tons of waste is discharged into water bodies every day. What makes this issue worse is that there isn't enough monitoring of these constantly changing water bodies. It's really hard to solve a problem when you don't even know exactly what the problem is. What we need is large-scale, high-frequency, readily available data to help us take more informed action. To enable this kind of data collection, I've built a system that allows school students and citizens - even ones without scientific experience - to easily gather scientific water testing data, and to also share, analyse and understand that data. Hence, crowdsourcing. It's a powerful approach that lets us generate both data and awareness to fight the issue. My system helps citizens collect data through a low-cost, easy-to-use mobile-based water testing kit. 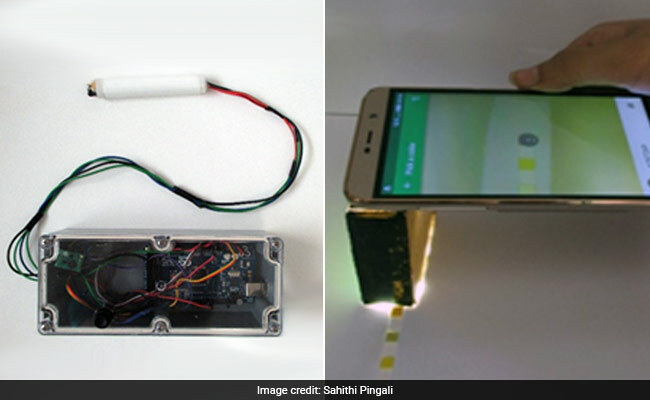 The mobile app works with electronic sensors and chemical test strips to let the user collect several physical and chemical parameters of a water sample. The sensors sync with the app by Bluetooth. The chemical test strips work with automatic phone-camera based color recognition and mapping software that I've built into the app. All you do is put the test strip inside a dark box, point your phone camera and flash at it, and click. The app maps the captured strip color to the contaminant concentration value, making everything easier and more accurate. The app also lets people collect pictures of bio-indicators, like birds or frogs near a lake, and pollution observations such as trash dumps or sewage inlets. It then takes all this data - physical and chemical parameters and pictures - and uploads it to a common cloud platform. This open, global cloud platform is the second part of my project. It's one thing to collect raw data, but I felt it was very important to make this data available and understandable to all. On the cloud platform, I've developed analytics and visualizations to help people use the water testing data. My favourite is one I call "the water health map of the world". It's basically a world map which shows you all the latest water testing data for bodies all over the world. And not only does it show you raw data, it also color-codes water bodies according to their safety level. For example, blue means the water is fit for drinking (with disinfection). Purple means it's fine to bathe in. Yellow that it's good for fish culture, and so on. This makes it easy for people to keep track of what their water is safe for. I've also written programs on the cloud that allow researchers to track how specific lakes and parameters are changing over time, and compare these parameters to desirable and permissible limits. Based on monitored parameters the cloud can also generate recommended actions for a lake or suggest nearby model lakes where similar pollution issues have already been fixed. Hopefully these will help activists get better insight on how to revive these water bodies. We've already applied this entire system to monitoring several different Bangalore lakes, and as I travelled around the world for these science fairs I've been adding data from almost all the cities I visit - from Hyderabad and Delhi to Houston and LA. The ultimate aim is for this platform to become an unprecedented treasure trove of data, a place where anyone can know the health of any freshwater body across the world at any time. To make this a reality, students, schools and citizens throughout the globe will need to adopt and monitor water bodies near them and keep the water insights map fully populated and current. I've set up the infrastructure, but ultimately everyone needs to become guardians of their local environment. 4) Do you feel the lakes of Bengaluru can be saved? Yes, I do think they can be saved. Lakes are pretty resilient - some people call these wetlands 'kidneys of the landscape' because of their ability to bio-remediate pollution and essentially clean themselves. The problem we have is that we've taxed lakes beyond their ability to take care of themselves; if we cut down on pollution and make a coordinated effort to revive these water bodies, I believe they can be restored. Especially with the widespread citizen interest and various organizations recognizing the value of lakes, I think there's definitely potential to rejuvenate many of them. 5) What was the ISEF experience like? In a word? Unforgettable. That one week was jam-packed with so much amazing that I don't even know where to start. I met so many incredible, inspiring young scientists from all over the world, and got to share stories and experiences with them. I made friends I'll stay in touch with for years - Team India in particular was really close knit and I can count some of them among my best friends. It was also really great to get feedback from such accomplished, path breaking researchers and scientists. Having them actually visit my stall, listen to me present, and give me their insights was such a gift. Getting to share my research with the world, experts and general public alike, was definitely one of the best parts of ISEF. And, of course there were all the fun things that SSP arranged for ISEF participants. I loved hanging out at the Intel Quad (filled with virtual reality games, music, and DIY fun), attending the pin exchange ceremony and the mixer/party event, and visiting Universal Studios! As a Harry Potter fan, that last one was a particular favourite for me. 6) What was your initial reaction when you hear about the planet being named after you - how did you find out about it? It was during the grand awards ceremony. Right before they started announcing the second and first grand awards, they played a video telling us how if you won first or second you got to name a planet. I was literally shaking from nerves - at that point, I knew I had either won a planet or nothing at all. So when they announced my name, I was so relieved and happy and amazed that I just couldn't stop smiling as I climbed the stage. I'm the eldest of three sisters - my sister Lalitha is twelve and Sreekari is nine. My father Gopal Pingali is Vice President and Distinguished Engineer at IBM Global Technology Services Labs. My mother Aruna Pingali looks after me and my two younger sisters Lalitha and Sreekari, teaches classical dance, and also runs a non-profit organization called Satkaro Foundation. My family is from Andhra Pradesh but for the first eight years of my life we lived in New York in the United States. Then we moved to Bangalore, and we've lived here ever since.